Agnis, a Nord citizen, can be found inside Fort Greymoor. 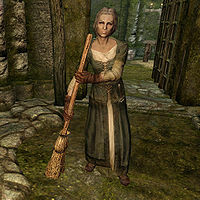 She acts as the joyful maid to whoever holds Fort Greymoor, although she gives the fort commander a hard time in her Complaint Letter. Nazir will give you a Dark Brotherhood contract to assassinate her. She has her own quarters in the fort, in the northeastern wing, and she sleeps there every night between midnight and 8am. The rest of her time is spent cleaning the surrounding area and neighboring dinner hall, occasionally resting on a chair, eating or taking a nap. Agnis wears a set of clothes, boots, and gloves. She also keeps a steel dagger on her person, to defend herself in case Fort Greymoor's many masters and visitors prove to be less than friendly. Agnis lives a strange existence of a servant to whoever hold Fort Greymoor, with her not caring about who that may be. Attempting to speak to her before starting the Dark Brotherhood quest Kill Agnis will have her offer some comments on her peculiar life: "I just cook, and clean, and do whatever it is they ask of me." "I can't even keep track of all the people who have been in and out of this fort. They come, they go. I barely notice." "Hard enough to keep up with who owns this fort. One side takes over, the other runs away. I tell them, "I ain't leaving! I come with the place!" Ha!" "I remember one morning, long time ago, I woke up and the place was run by some Orcs. Went to bed that night, it was all vampires. Don't matter to me." "Now, then. I been gabbin' long enough. Too much cleanin' to do." "You've cleaned your last room, servant." "But I have many more rooms to clean. Fort Greymoor is quite large, and rather filthy if I do say." "Sleep now, old woman. Embrace the Void." "Sleep? I can't sleep now! There's too much to be done. And what's this Void you're rambling on about?" "(Remain silent)" "I swear, you people are an odd bunch. Please, just step aside, that I may return to my duties!" After doing the deed and reporting back to Nazir, he will compliment you on a job well done before giving you your payment: "Don't worry, my friend, I'll spare you the facetious quip about killing a defenseless old woman. Infiltrating an occupied fort and making it out in one piece is nothing to joke about. Well done. Your payment for services rendered. If she is nearby when bandits occupying the fort are engaged in combat she will fight the bandits with you. Agnis belonging to the Dark Brotherhood faction can cause you to get expelled from the Dark Brotherhood if she gets attacked at the wrong time. This page was last modified on 26 December 2017, at 12:28.